Sweden Democrats party leader Jimmie Akesson attends a press conference in Stockholm, Sweden. The surge in support for a fringe party makes the country hard to govern. Sweden is struggling to form a government a month after inconclusive elections. The populist Sweden Democrats achieved its best-ever results in the September 9 vote, receiving 5 percent more than they did in 2014. The Social Democrats, Sweden’s established center-left party, experienced its worst result since 1911. Final results placed the Sweden Democrats third at 17.5 percent, behind the center-right and center-left blocs, which are nearly tied. The center-right alliance, composed of the Moderate Party, Liberal Party, Center Party and Christian Democrats, received 40.4 percent of the vote. The center-left, composed of the Social Democrats, the Green Party and the Left Party, received 40.7 percent. With more than 60 seats in parliament, the Sweden Democrats have “reshaped the country’s politics, wrote Politico. 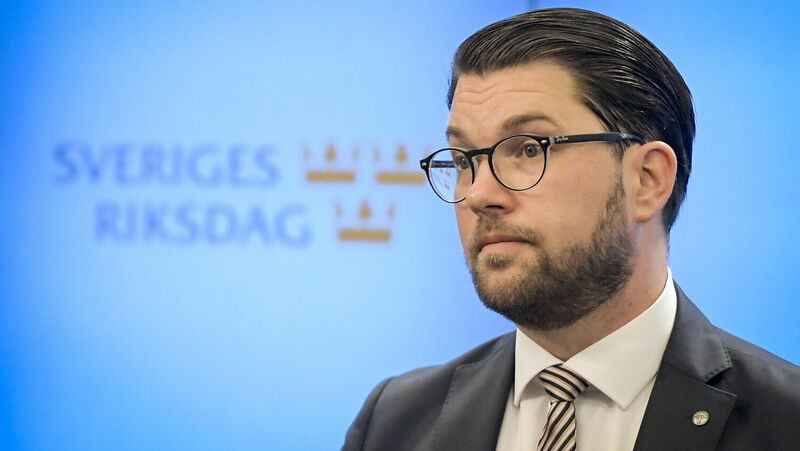 Some fear that this will cause political paralysis, since the center-left and center-right political blocs both refuse to work with the Sweden Democrats. But cooperation will be hard to avoid. Neither the right nor the left blocs are able to form a coalition alone, and negotiations are expected to be lengthy. Jimmie Akesson, leader of the Sweden Democrats, threatened to “take down” whoever becomes the coalition leader. It remains to be seen whether or not Prime Minister Stefan Löfven will step down. If he does not step down in the next two weeks, his future will be decided by a vote. When a previously unpopular fringe party with neo-Nazi roots gets its best-ever election result and paralyzes the political system, we need to evaluate how times have changed. The Sweden Democrats could have done even better: according to Politico, “established parties took a new, hard-line approach on immigration—effectively stealing the Sweden Democrats’ thunder—while still focusing on the traditional welfare issues that appeal to their core voters.” Although they expressed it with softer words, this year more parties addressed issues they previously avoided—like crime and mass migration. In Sweden’s case, as in much of Europe, people want answers about what to do in a rapidly changing world. This has led to a surge in successful populist parties. To see populism’s rise, look at the Austrian People’s Party and their recent victory under Sebastian Kurz. Or look at the German Alternative für Deutschland (AfD), which some analysts say has become the second-largest party in Germany. Then there are Italy’s Lega and Five Star Movement parties, which rose to prominence this year. All of these were fringe parties until recently. Germany’s AfD, for example, was founded only in 2013 and has since had members elected at all levels of German politics. Though we may not see dramatic landslide victories, the populists keep gaining. Why is this, and what does the future hold? Europeans have been besieged by immigrants from the Middle East, growing Muslim populations within their midst, cityscapes filling with mosques and minarets, portions of their cities turning into Muslim enclaves that local police dare not enter, even Islamic terrorist attacks. The rise of new parties and fringe parties points to a political revolution beginning in Europe. This revolution is prophesied in Revelation 17, which describes modern Europe being led by “kings”—autocratic strongmen—rather than democracies. The growing support for anti-system parties show major dissatisfaction with the current political system, while also paralyzing that system. To understand more about where this political change is leading, read our free book The Holy Roman Empire in Prophecy.